We’re all about healthifying takeout food. Our most successful attempts to date are General Tso’s Chicken and Thai Peanut Noodles. But I do believe that we have another to add to the list. Tonight we not only made a favorite fried dish more healthy, we also made it vegan. We turned to Mama Pea for assistance because, well, she’s a superstar when it comes to tasty vegan dishes. Quinoa (a recent obsession of ours) replaces the traditional rice and is cooked with equal parts vegetable broth and coconut milk. It’s then combined with garlic, ginger, green onions, peas, and pineapple. Finish with a handful of cilantro, a couple shakes of soy sauce, and a wedge of lime, and devour! What’s your favorite quinoa dish? As I said, we’re hooked. Set a saucepan over medium-high heat and add quinoa. Cook until toasted, about 4 minutes. Combine coconut milk and vegetable broth and add to quinoa. Bring to a boil, then lower heat to a simmer, cover, and cook 15-20 minutes, or until liquid is absorbed. Meanwhile, add a small of amount of olive oil to a skillet and place it over medium heat. Add green onions, ginger, and garlic; sauté for 2 minutes. Add peas, pineapple, and cilantro; sauté for an additional 2 minutes. Add quinoa to the skillet and cook until slightly brown and crisp, about 2 minutes. mmmm, looks yummy! I was actually about to try out some quinoa for my 8 month old to eat. I have a couple of baby food recipes for him that includes this. 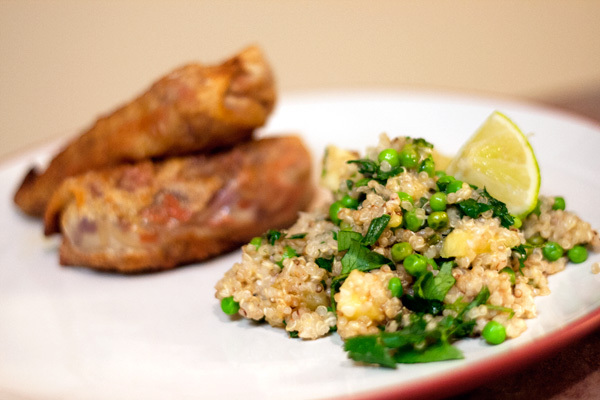 Maybe Mommy and Daddy will make this dish with the rest of our quinoa! Thanks!